Molly Caldwell Crosby once again brings forgotten history to vivid life in an absorbing account of crime and deduction in the early days of the twentieth century. . . .
Molly Caldwell Crosby is the national bestselling author of Asleep: The Forgotten Epidemic that Remains One of Medicine’s Greatest Mysteries and The American Plague: The Untold Story of Yellow Fever, the Epidemic That Shaped Our History, which has been nominated for several awards. Crosby holds a master of arts degree in nonfiction and science writing from Johns Hopkins University and previously worked for National Geographic magazine. Her writing has appeared in Newsweek, Health, and USA Today, among others. Molly Crosby is a best-selling author and journalist. Her first book The American Plague: The Untold Story of Yellow Fever, the Epidemic That Shaped Our History was published in November 2006 by Berkley Books, Penguin, USA. The New York Times hailed it as a “first-rate medical detective drama,” and Newsweek called it “gripping.” The book has been nominated for the Barnes & Noble Discover Great New Writers Award, Borders Original Voices Award and Southern Independent Booksellers Award. It was also chosen as a New York Times Editor’s pick and a Book Sense pick. Crosby's second book, Asleep: The Forgotten Epidemic that Remains One of Medicine’s Greatest Mysteries, was released March 2010. Oliver Sacks, author of Awakenings, called it a "brilliant and deeply moving account." Publishers Weekly wrote, "Here's medical curiosity combining history, mystery, and riveting storytelling...The remarkable human connection Crosby brings to this scientific oddity helps enlighten readers about a pandemic forgotten in the shadow of the contemporaneous Spanish flu...." Asleep was an April pick for Scientific American magazine and a May pick for Discover magazine. Her third book, The Great Pearl Heist, released November 2012. It has been chosen for the Indie Next List for December 2012 and as one of Barnes and Nobles Best Books of the Month. B&N calls it "one of the most engrossing true crime tales of all time." Salon.com says it's, "a ripping yarn...delightful." Booklist (starred review) describes it as "thriller-style" and "compelling popular history." Publishers Weekly calls it a "winning true crime tale," adding, "the author highlights the case's major influence on British crime detection...adding a dash of color and realism to a largely forgotten chapter of Edwardian London." Candice Millard, author of Destiny of the Republic and River of Doubt, describes it as "rich and evocative...as enchanting and irresistible as its subject." And Jeffrey Jackson, author of Paris Under Water, writes that it's "fast-paced, full of twists and turns, and rich in detail...a fascinating story rooted in such deep historical research that we can practically watch the drama unfold in real time." Crosby holds a Master of Arts degree in nonfiction and science writing from Johns Hopkins University's Zanvyl Krieger School of Arts and Sciences and spent several years working for National Geographic magazine in Washington, DC. Her writing has appeared in Newsweek, Health, and USA Today, among others. She has participated in interviews with NPR's "Morning Edition," The Diane Rehm Show, C-SPAN Book TV, John Seigenthaler's "A Word on Words" and Bloomberg Radio. Crosby has also served as a visiting professor in creative nonfiction in the Master of Fine Arts program at the University of Memphis, as well as giving talks around the country about her books. Today, Crosby lives in Memphis with her husband and two daughters. 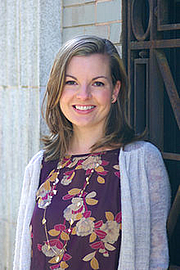 Molly Caldwell Crosby is currently considered a "single author." If one or more works are by a distinct, homonymous authors, go ahead and split the author. Molly Caldwell Crosby is composed of 3 names. You can examine and separate out names.